UNITED NATIONS, July 14 -- Amid controversy about the use of mercenaries to face off against pirates off the coast of Somalia, the US State Department's Donna Hopkins on July 14 told Inner City Press “there's a robust international effort [about] the use of armed security, private or not, and how it should be regulated, if at all.” Video here, from Minute 13:30. Earlier in the month, the chairman of the UN's Working Group on mercenaries told Inner City Press that a draft convention to regulate private military contractors is being opposed by large states. Apparently, even with Blackwater having renamed itself Xe Services and moved to the Middle East, the US is still opposed to regulating mercenaries, including on the high seas. Hopkins is formally the Coordinator of the Counter Piracy and Maritime Security Bureau of Political Military Affairs at the US State Department, and chairs “Working Group Three” of the Contact Group on Piracy off the Coast of Somalia. Denmark's Legal Adviser Thomas Winkler declined to say if the use of armed security is good or bad, but added that no ship with armed guards has been hijacked. Another Contact Group member, Egypt's Deputy Assistant Foreign Minister and Counter Terrorism Coordinator Ashraf Mohsen, adopted an even harder line. Inner City Press asked if the Contact Group has done anything about illegal fishing or the dumping of toxic waste. As if to counteract this position, Mary Seet-Cheng of Singapore said that piracy cannot be solved at sea. The UK's Chris Holtby chimed in about efforts on the rule of law in Somalia, the development of its Exclusive Economic Zone. He did not mention outside involvement in what purported to be Somalia's own Law of the Sea filing. And so it goes at the UN. Inner City Press: on Somalia, there is quite a lot of protest within the country about a supposed consultative meeting that Mr. Mahiga is organizing in Kenya and there have been calls to boycott it. The Government has also asked that the UN move its offices to Mogadishu. So, what’s the UN’s response to these two critiques, both from clan leaders and from the TFG? Spokesperson Nesirky: Well, Mr. Mahiga extended this invitation to various parties there to take part in some discussions and we are aware of the report or the reports that you refer to about the presence of UN offices in Somalia; we’re aware of that report. I don’t have anything further on that at the moment, simply to say that the people who work for those offices are regular visitors to Mogadishu. 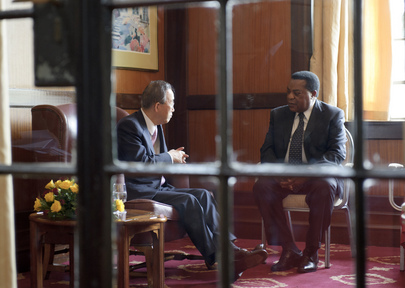 Indeed Mr. Mahiga was briefing the Secretary-General last week when we were in Nairobi, within hours of having just returned from Mogadishu. Augustine Mahiga, the Secretary-General’s Special Representative for Somalia, said today that the High Level Consultative Meeting will take place as scheduled on the 12 and 13 April in Nairobi. He said that he has received positive responses to the conference from Somali parties and officials who are willing to participate in strengthening the dialogue between the Transitional Federal Government (TFG) and its partners. What do Ban and Nesirky say to that? The UN of late has been bragging about "its" Djibouti process. And it's come to thise? Watch this site.